Easily 50 percent of the leads that your marketing team unearths are not yet sales-ready—but rather than dumping that half of those prospects in the rubbish bin, nurture them to increase your haul of sales-qualified leads. Building trust and fostering relationships with qualified prospects, regardless of their stage in the buyer’s journey, is a key element to surfacing quality leads that can be nurtured through the funnel. But creating a successful lead nurturing program can be overwhelming. Matt Heinz, President of Heinz Marketing, sums it up: “A survey earlier this year indicated that a mere 10 percent of companies were actively using lead-nurture strategies as part of their demand generation and pipeline management marketing. 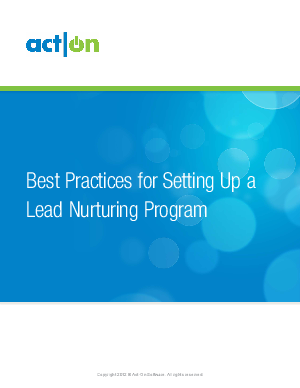 Even for those, implementing a more complex closed-loop system may feel intimidating and out of reach.” In this report, Heinz and his fellow thought leaders demystify lead nurturing, offering best practices that you can follow when developing your own winning program.